PHOENIX – The Transportation Security Administration confiscated 75 guns at Phoenix Sky Harbor International Airport in 2014, the fourth-highest total in the nation, a Cronkite News review found. Phoenix followed Dallas/Fort Worth International Airport, which had 116 confiscations, Hartsfield-Jackson Atlanta International Airport, which had 107, and Houston George Bush Intercontinental Airport, which had 76. Sky Harbor’s total was up from 65 in 2013 and 53 in 2012. Tucson International Airport had 12 confiscations in 2014, up from eight in 2013. Phoenix-Mesa Gateway Airport hasn’t had any since 2012. The data came from weekly updates posted to the TSA’s blog and information compiled by the Medill National Security Journalism Initiative. Jeffrey C. Price, an aerospace science professor at Metropolitan State University of Denver and an expert in aviation security, said state gun laws contributed to how the top airports ranked. “If you look at the states where there’s the highest number of confiscations, they’re all states that have rather liberal conceal-and-carry laws and a lot of people carry firearms,” Price said. 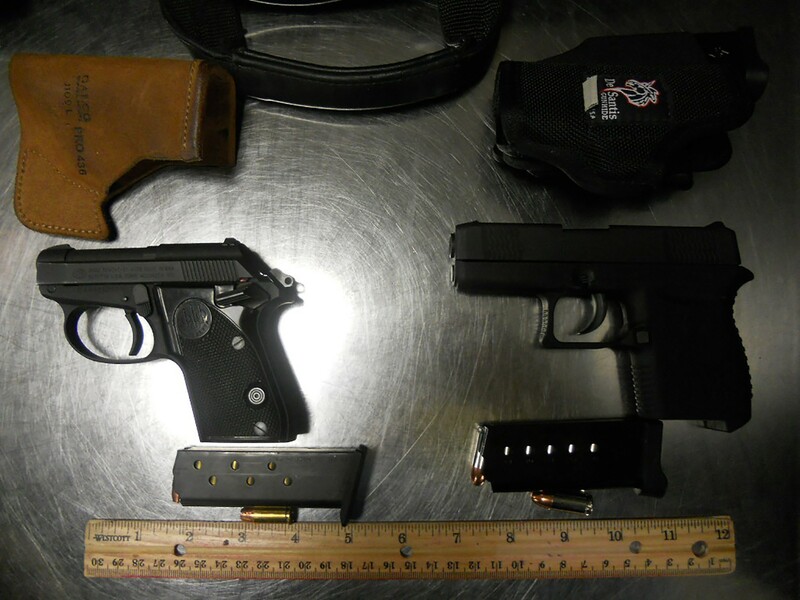 The most common type of weapon confiscated at Sky Harbor was a 9mm pistol, with 19 of those seized, followed by a .38-caliber pistol, with 11 seized the data showed. 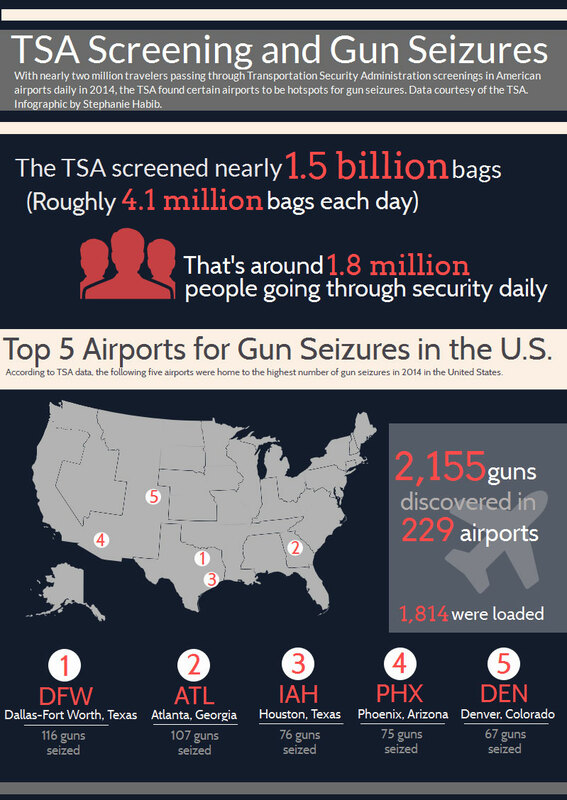 In 2014, TSA security checkpoints confiscated 2,155 weapons in 229 airports across the country, averaging to almost six a day and up 14 percent from last year, according to the Medill National Security Journalism Initiative. More than 1,800 of those were loaded. A decade ago, weapon seizures were at only two a day nationally, according to TSA spokesman Nico Melendez. “Passengers aren’t doing the research themselves before they come to the airport,” he said. Rules that been in place since 9/11 are available at TSA.gov or through the My TSA mobile app. The TSA has the legal authority to assess civil penalties up to $7,500 when its workers find guns in carry-on items. The agency then alerts local law enforcement to determine whether there was criminal intent. Richard Bloom, director of terrorism, intelligence and security studies at Embry-Riddle Aeronautical University, said most people who bring these type of weapons to the airport don’t pose any kind of security threat. Price noted that those with conceal-and-carry permits are instructed to check the laws of other states when traveling, but he said many aren’t clear that in transit they are only allowed to transport firearms in checked baggage. Bloom agreed, adding that spreading the word about the potential penalties could cut down on weapons brought to airports. “More effective communication has to occur, not only about what the rules are but also about the consequences so that people are likely to comply with the rules,” he said. Click on the map to review seizures at the top 10 airports during the past three years. At a March 2014 news conference warning travelers against bringing guns through checkpoints, the Transportation Safety Administration displayed these examples of guns confiscated at Phoenix Sky Harbor International Airport.